I hope everyone had a lovely holiday weekend full of epic Star Wars movie fun! I don't know what the weather is like where you live, but our December weather is insane! In fact, we sat outside in shorts by the pool and got a tan on Christmas Eve. Since then, it's dropped to just-above-freezing and I wish the weather would just pick a season already. 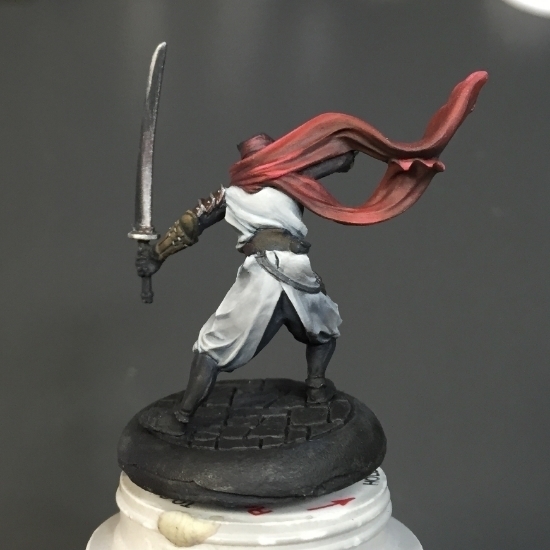 While it's definitely not a White Christmas around here, we do have some white around here-- I decided to paint the Anima Tactics Shinobi's robes an off-white color rather than the dark blue/black I planned on. The dark colors would have taken less time to paint (at least for me), but I was up for the challenge since I hadn't had time to paint in weeks. I was more than ready to try painting something new after the stress of the holidays and travel. I will say the white is a challenge! (I love it.) I used a Dirty Gray base coat and I'm highlighting up to Leather White, one of my favorites from the Reaper paint series. In the darkest recesses, I used Dirty Grey and a touch of Blue Liner. 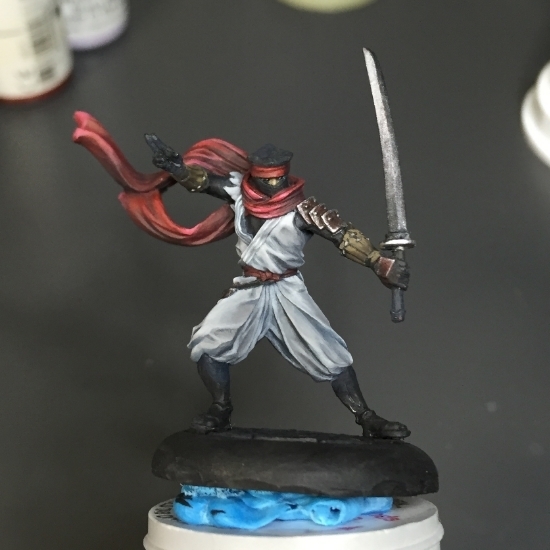 He's about 75% finished and I'm really happy I was able to paint some tiny pupils in his eyes that are obscured by his ninja face mask. Other than that, my Secret Sophie is back on track. I had a bit of a frustrated meltdown once the top of her bow came off. I ended up reaching out to the Reaper forum for some advice. They were very helpful and offered a few different ideas since I'm new to sculpting-- I've only used Green Stuff for gap-filling and minor conversions so far. Something so simple, like resculpting the top of the bow, had me frustrated since I could get the shape just right and my patience was lacking. On the other side of the miniature, the bow extends straight downward and is sculpted into the leg. Replacing the bow would have been too much work. I settled on a good compromise (see below). If this taught me anything, it's that patience and Green Stuff go hand in hand. It's best if you do something in several steps, knowing that it can't be pinned, sculpted, glued, and filed to perfection all in one sitting. I was stubbornly thinking I could get it done faster if I could just create the perfect shape before I had to wait for it to cure. (Yeah, it was silly but I'm learning.) I'll soon cut down the green stuff to match the proportion of the lower half of the bow once the glue dries and I can make it a seamless transition between the pewter and the Green Stuff. I giggle because it almost looks like the fox is holding a bow/lightsaber. It's probably because I haven't been able to get Star Wars off my mind since I saw The Force Awakens. If you haven't gone to see it, go see it! It's not a perfect movie but it's much better than Episodes I-III. I won't spoil anything here (yet), and I'll give everyone a solid two weeks to go see it. It exceeded my expectations and they could have done much worse. Seriously. It was great. I want to go back and see it in 3D! For now, I'll settle on turning on the Original Trilogy (Episodes IV-VI) while I paint. Cheers!